Visiting the Mermaids. What Do You Mean Those Are Sea Cows? Just two more days until the first installment of Depths of War launches here on my webpage. We are heading into the last week of Mer-May and I've got mermaid fever. Okay, maybe the fever has more to do with my kid getting strep throat and breathing in my face for three days. (I should really get that checked out) But I do have mermaids on my mind and I can't but help to see them everywhere. Recently we had the chance to visit a place with real live mermaids. What? You doubt me? You don't think mermaids are real? Oh! but so many sailors in the days of old spotted them in their travels. Sure, sure... it turns out they were manatees, but one man's sea cow is another man's mermaid. 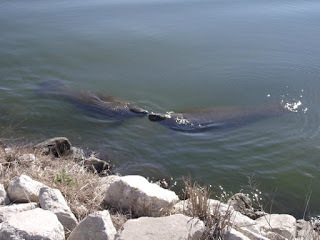 We visited the Merritt Island National Wildlife Refuge a couple of weeks ago and happened upon some mermaids manatees while there. It's not hard to happen upon them actually. There is a specific spot they like to hang out and watch the people. Once you hit that spot, you're sure to see some of the lovely mer-creatures. 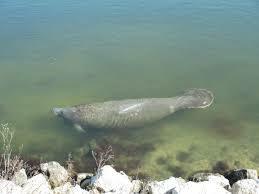 If you're ever in Florida, be sure to make a trip to visit these beautiful creatures. It's worth the trip. And coming back here this Friday, May 25th to catch the first installment of Depths of War will be worth the trip as well.